EPFL scientists have completed the fastidious task of analyzing 27 dwarf galaxies in detail, identifying the conditions under which they were formed and how they've since evolved. These small-scale galaxies are perfect for studying the mechanisms of new star formation and the very first steps in the creation of the universe. Dwarf galaxies don't emit much light and are therefore hard to observe, but they have a lot to teach us about how the universe was created. 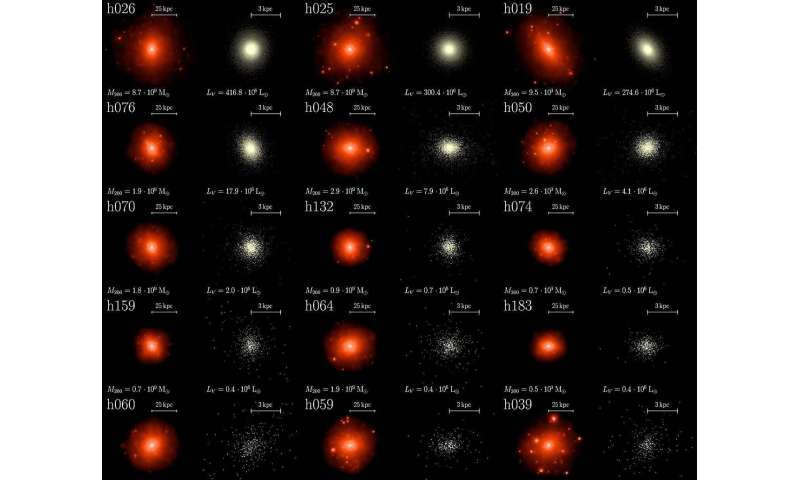 A team of scientists from EPFL's Laboratory of Astrophysics (LASTRO) meticulously studied 27 such galaxies and found a surprising degree of variation in the mechanisms by which their stars were formed. The results of their painstaking work was published in Astronomy & Astrophysics. "Dwarf galaxies are the smallest and probably the oldest galaxies in the universe. Under standard cosmology theory, larger galaxies are formed by the merger of these smaller ones," says Yves Revaz, a galaxy dynamics expert at LASTRO. While they may be called "dwarves," they are in fact huge and can weigh anywhere between hundreds of thousands and several million times as much as the sun. They are also the galaxies with the most dark matter. The LASTRO team therefore had to develop highly sophisticated computer models to study these galaxies' properties, size and temporality – all of which go well beyond our basic understanding. Their models take into account each of the galaxies' components – gases, stars and dark matter – as well as the relationship between dark matter and visible matter (called "baryonic matter" in astrophysics). The models also factor in the conditions under which matter was formed when the universe was first created some 14 billion years ago – conditions that are now known thanks to recent space missions carried out to discover the signatures of the Big Bang. To analyze the dwarf galaxies, the scientists first took each model and went step by step through the galaxies' key characteristics like how much gas (mainly hydrogen) they contain, the heating and cooling of their interstellar mediums, their compression and expansion processes, the successive generations of their stars, those stars' supernovae, and the resulting release of an array of chemicals. The scientists then compared the results of their models with data that had been obtained by observing dwarf galaxies – more specifically, those orbiting our galaxy, the Milky Way, and its neighboring galaxy, Andromeda (M31) – using eight-meter optical telescopes, the biggest that are currently out there. These dwarf galaxies form part of what is called the Local Group and are close enough for astrophysicists to be able to obtain accurate information on the ages and chemical components of individual stars. Making sure that the models' results match empirical data is essential if the scientists want to use them to test their theories about dark matter, the kinds of objects responsible for the reionization of the universe, and the conditions and time periods for new star formation. This is the first time that dwarf galaxies have been examined in such detail and under cosmologic conditions – that is, not by considering them as isolated systems but rather by taking into account all the interactions among the very first galactical systems. "The advantage of dwarf galaxies is that they respond very well to even minor changes in conditions, making them excellent guinea pigs for studying galaxies in general," says Pascale Jablonka, a LASTRO researcher specialized in spectroscopy and galaxies' chemical development and co-author of the study. For instance, by analyzing the light that stars emit, she was able to determine their chemical composition and how long it took them to form. "Our models enabled us to create a database of many different types of stellar activity and gave us valuable insight into the factors that can cause star formation to speed up, slow down or even stop altogether," says Revaz. Based on the data they collected – which include an impressive number of different star-formation mechanisms given how "small" dwarf galaxies are – the LASTRO team found that the specific mechanism used depends on the density of the galaxy's dark and baryonic matter. That density determines whether a galaxy will keep on making stars or suddenly stop. If a dwarf galaxy's matter is too dispersed, then its hydrogen will get too hot and evaporate, meaning it can no longer form stars. If on the other hand a dwarf galaxy has a dense halo of dark matter protecting it, then star formation will continue apace. The reason for the mistaken notion the galaxy is missing dark matter is that the galaxy is so diffuse that it doesn't displace the dark matter outward and away from the galaxy to the degree that the dark matter is able to push back and cause the stars far away from the galactic center to speed up. A galaxy's halo is not a clump of dark matter traveling with the galaxy. A galaxy's halo is displaced dark matter.